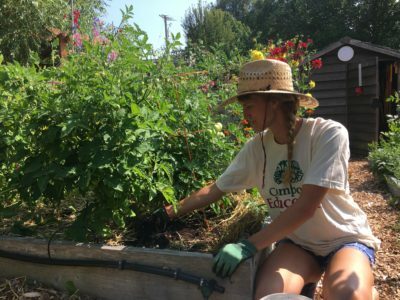 Alysha Punnett wrote an excellent article published in the Village Vibe about organic pest management. Check it out here! 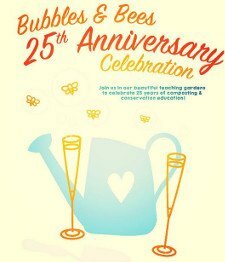 Bubbles and Bees is the Compost Education Centre’s 25th Anniversary party, so come on down and help us celebrate 25 years of composting and conservation education! 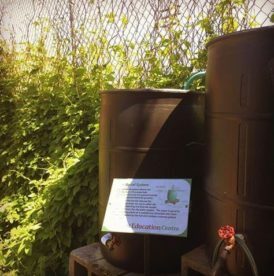 Discover how the Compost Education Centre has evolved over a quarter of a century during our open-house style, family friendly, free event, which will feature musical entertainment, face painting and local wine and beer sampling by donation. Thank you for your interest in Healing City Soils, the next round of applications will be open in early 2018. Due to manufacturing price increases, our Green Cone Digester price will rise on June 1st to $180.00. We currently have 20 Green Cones in stock at our old price, $165.00, or for members, $148.50 so get ’em while you can! Thank you so much for your continued to support of the CEC and for your understanding, please feel free to email us at office@compost.bc.ca, if you have any questions. The cover crop of crimson clover and winter field pea that I sowed the veggie beds with last fall has also been enjoying the warmer weather in a big way. Before I knew it, it had put on 6 inches of new growth and it was time to shear, compost and turn in in preparation for planting season. Generally, you want to get this done a few weeks before planting anything in the bed. This allows the roots of the cover crop to die, releasing their fixed nitrogen back into the soil, which can then be taken up by your transplants. 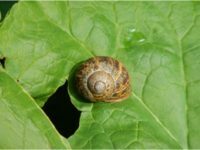 A side benefit is that it turns pest cocoons and larvae up to the surface where they can be gobbled up by birds, other insects or killed off by the weather. First, I shear the tops off the plants and toss them in my compost pile. There’s a lot of green material there, so I tend to make a big hot compost. Many use tillers to turn in cover crops, and this is necessary if you’ve used a more robust crop such as winter rye. 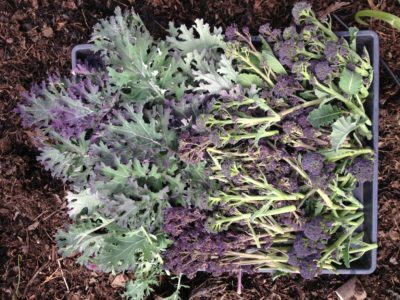 Because I choose more tender crops, I use a shovel and chop two rows down the bed, then chop perpendicular to the rows to create a kind of grid over the bed. This allows you to lift chunks of the cover crop and flip them completely over. Once this is complete, I gently chop my way through the whole bed to cut the roots up and ensure the cover crop dies off in time for planting. As you go, keep an eye out for the tell-tale root nodules that show you how hard your nitrogen-fixing cover crop (i.e. legumes such as crimson clover or winter field pea) has been working for you. As the plants die, this nitrogen is returned to the soil. Want to know more about the benefits of cover cropping? Head over to our Facebook, Instagram, or Twitter and leave us a comment that says “Tell me more!”.